There are a few things I don’t understand about Southerners. I love the south and know some fantastic folks who whistle Dixie: my sister in law is the sweetest Southern girl ever and we have a best friend from law school who is a credit to to the South. 1. Biscuits and Gravy for breakfast. 2. How are those drive through margarita places POSSIBLY legal?!? 4. “A Coke” vs. A soda or pop. I don’t say “I’ll have a beer” and then order the Chardonnay. (shakes head) Agree to disagree. 5. And a recently uncovered mystery: how do Southerners keep their homes from smelling like a diner for days after frying chicken? Lingering smells of oil aside, fried chicken was pretty fun and it’s easy. I followed the recipe in ye ol’ Joy of Cooking, but its a pretty basic process, even for someone like me with really no knowledge of frying. Step 1: Marinate Chicken overnight. 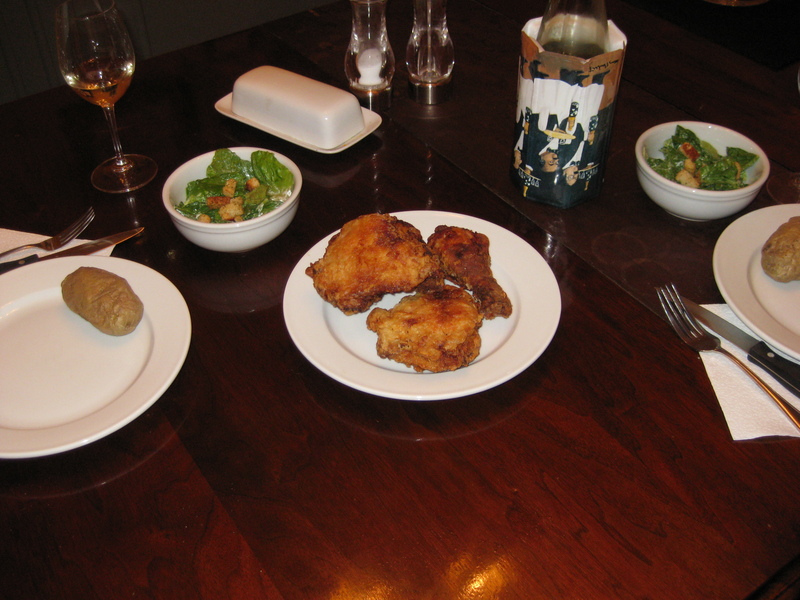 I used salt, pepper, and buttermilk and a mixture of drumsticks and thighs. I have a picture of the chicken marinating that I was going to insert here, but honestly, it was sort of scary looking. And you all know what raw chicken looks like. Step 2. 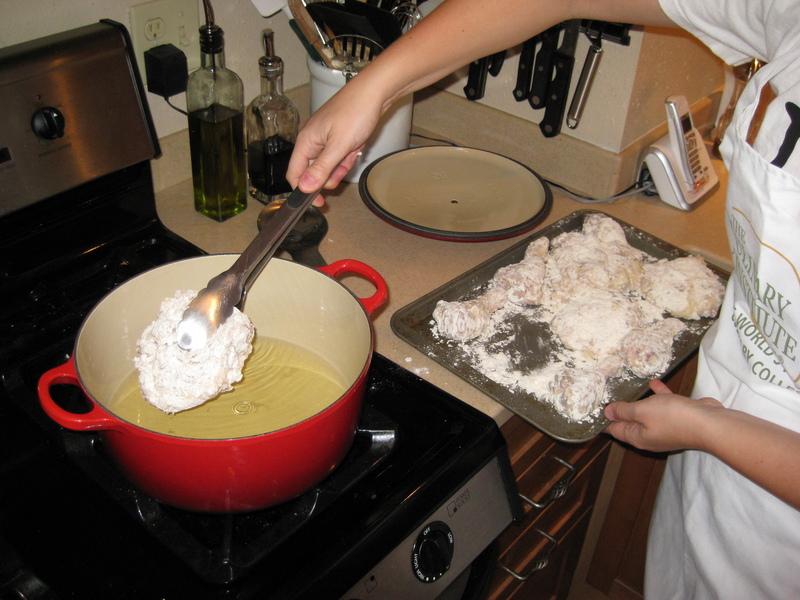 Dredge chicken in egg and then in flour. 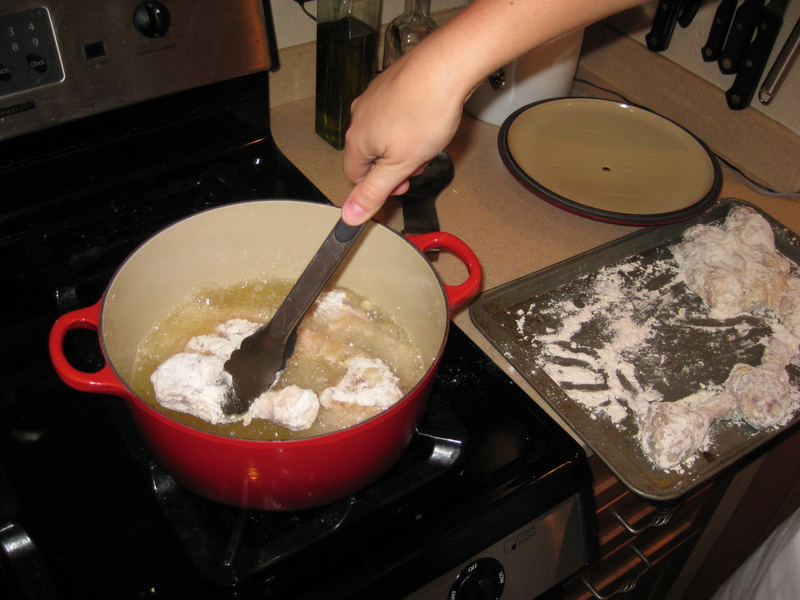 Note: when I make fried chicken again, I will try a different breading material. The flour was good, but it absorbs quite a bit of oil. Anyone have suggestions? Step 3: Fry on each side until brown, about 6 minutes or so. Make sure your oil isn’t too hot, or you’ll only cook the outside. Only cooking outside = unhappiness inside. Last one in's a chicken!! You can put in several pieces at once, cooking in batches. Step 4: Let cool slightly. Step 5: Plate and eat. Step 7 (optional): Take leftovers, cold, to Shakespeare in the Park. Watch for looks of envy from other picnickers. Enjoy the charmingly retro delight of eating a cold fried chicken drumstick on a picnic. UNFORESEEN BONUS: This fried chicken was nothing like mass produced, dry fried chicken you might encounter elsewhere. It was tender, moist, and soft. 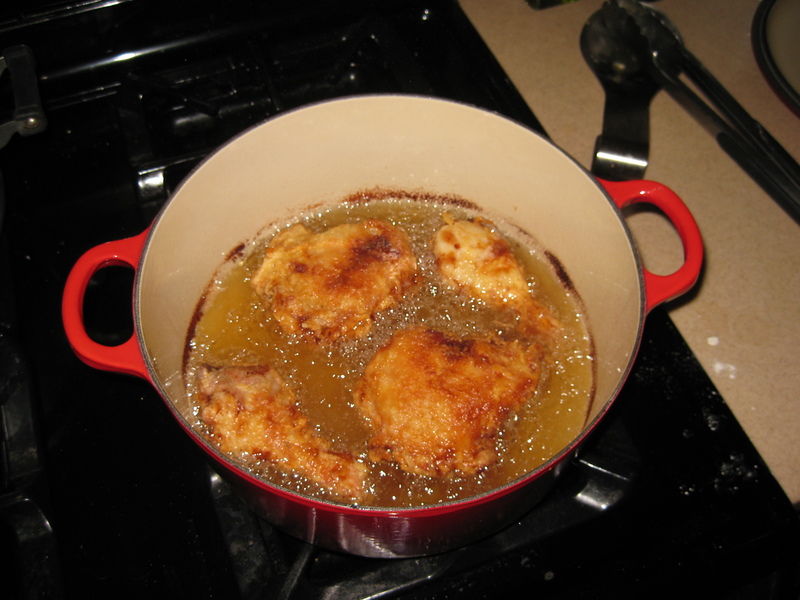 It tasted deliciously chicken-y….a taste you often lose in other cooking methods. I think these Southerners might be on to something….. So open the windows, run your exhaust fan**, and fry yourself a picnic treat before summer is over! The smell will dissipate in a few days. ** Skip the exhaust fan if it terrifies your pup and sends her into hiding under the bed for several hours.